United Airlines is putting the kibosh on calling in with complaints. 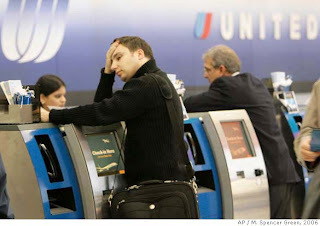 Last week the airline confirmed that, come April, it will disconnect the phone line to a foreign call center contracted to field customer compliments and complaints. Customers with issues to discuss will still be able to call the airline’s general 800-number but, as anyone who’s tried navigating United’s (or any airline’s) automated phone tree knows, the focus there is on selling tickets and tweaking reservations. From here on out, even if you get through to a live United Airlines agent, you’ll likely be told to send post-flight comments, good or bad, in old-fashioned letter form or via e-mail. Why quit answering the phone? However, many travelers, hospitality industry experts and folks in the field view the call-center closure as a cost-cutting measure and yet another step away from focusing on customer care. Others suspect that as the economy worsens and budgets tighten, live customer-service centers will disappear elsewhere as well. But that’s doesn’t mean well-mannered travelers should stop giving feedback on service. We may just need to learn some new skills — and sharpen some old ones. If it’s really fast help you want, then Tom Murphy suggests learning how to resolve travel complaints in real time. Murphy is the Director of the Human Resiliency Institute at Fordham University in New York and has been helping teach airport and airline employees how to solve customer issues before they become written complaints. He says the three key tools employees are taught to use — body language, tone of voice and words — can be used by travelers as well. Grayson is a literary agent who knows a thing or two about using words effectively. So he offers this opening line: “I’ve got this terrible problem that I hope you can help with. But if you can’t, let’s get someone who can." And in a world of cranky, unhappy travelers, if someone is asking for the moon, why not be their star?